The music of Miles Davis certainly needs no introduction. It has been covered in a myriad of styles, by a vast quantity of artists.Racha S’Miles is an ambitious project that deconstructs Davis’s music and hurls it into a rhythmic and exotic orbit exhibiting Brazilian sensibilities. 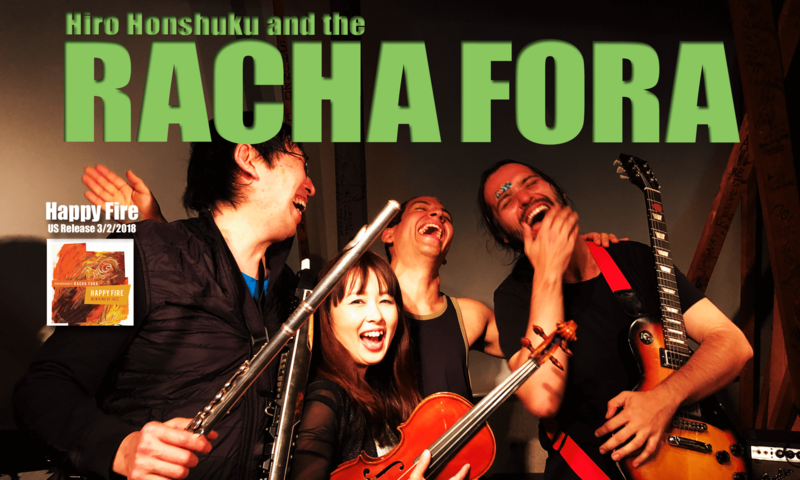 The Racha Fora ensemble consists of cross cultural musicians who have congealed into cohesive interpreters of global jazz with an ethnic tinge. The band centers on flutist/leader Hiroaki Honshuku, violinist Rika Ikeda, and guitarist Mauricio Andrade as the featured soloists. From the opening song of “Milestones,” which was given an accelerated samba treatment, it is obvious that this is no straight ahead tribute. Special guest and soprano master Dave Liebman takes his sax into those rarefied high registers, setting the mood for the album. “E.S.P.” by Miles alumni Wayne Shorter, revolves around the brilliant violin of Ikeda, whose virtuosity is on vigorous display. The pace is dramatically alleviated on “Blue In Green,” with Honshuku’s flute interplaying with Andrade’s singular Brazilian nuances. There is a trio of Honshuku originals in the middle of the set, where the band applies the Lydian Chromatic Concept of composition popularized by George Russell, which was Honshuku’s mentor. “Feather Roux,” “Chicken Don,” and “Door 8,” are fine examples of how sophistication and cadence can be utilized within the jazz framework of melody meets improvisation. It’s back to Miles with “Solar,” once again featuring Liebman on the soprano sax. There are few players around who have obtained the authority on this instrument as Liebman has, and he brings weighted credibility to this undertaking. The perennial standard “All Blues,” is given several tempo changes combined with a strong Latin flavor, courtesy of percussionist Benhur Oliveira, and bassist Rafael Russi. Since the group does not employ a trap drummer, Oliveira and Russi have the double duty of anchoring the rhythmic modulations, which they do with energetic zeal. “Circle,” is an acoustic guitar showcase, and has a distant baroque air about it. The evident South American direction shines on “Seven Steps To Heaven,” before they go back to another original on “Wood Row,” where Honshuku, on piccolo, offers a brisk exchange with Liebman, again on soprano. The mood changes to a funky samba on the closing track “Footprints,” also penned by Wayne Shorter. Honshuku shows his dexterity on the EWI—electronic wind instrument—and ends the show with a nod to not only Miles, but Shorter’s contribution to the music as well. Miles Davis was the personification of how a jazz musician must and should take chances to break out of the comfort zone and take abstract directions. Though some of his decisions were not popular at the time, his overall catalog shows diversification and innovation. Racha Fora took this approach, and propelled the trumpet icon’s music into unfamiliar territory. With their unique personnel lineup and musical abilities, Racha S’Miles is one worthy of further listening and appreciation. Personnel: Hiroaki Honshuku: flute, EWI; Rika Ikeda: violin; Marucio Andrade: nylon guitar; Rafael Russi: electric bass; Benhur Oliviera: pandeiro; Dave Liebman: soprano sax (1, 7, 11).